Student Walkouts Planned To Protest Gun Violence The demonstrations will last 17 minutes to honor the 17 killed last month. "If the government wants to keep getting paid, they need to listen to what we say," a Boise, Idaho, student said. 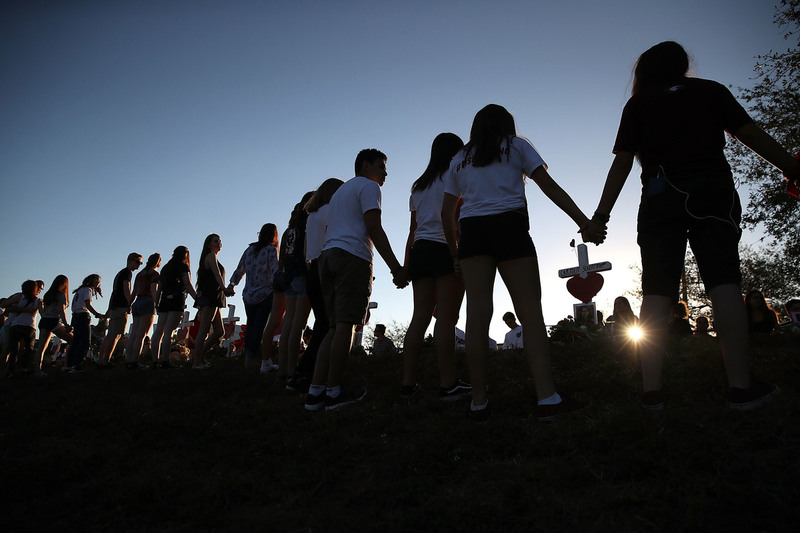 Students and family members hold hands around a makeshift memorial in front of Marjory Stoneman Douglas High School in Parkland, Fla., where 17 people were killed on Feb. 14. Seventeen-year-old Egzona Rexhepi and many of her classmates in Boise, Idaho, will join students at schools and universities across the country as they walk out of their school Wednesday to protest gun violence. The demonstrations will last 17 minutes to honor the 17 people killed at Marjory Stoneman Douglas High School in Parkland, Fla., one month ago. There are more than 3,130 largely student-organized walkouts scheduled, according to EMPOWER, the group behind the national school walkout. National organizers, who are the youth branch of the women's march, are advocating stricter gun regulation including bans on assault weapons and expanded background checks. While EMPOWER coordinated nationally, each school needed a leader organize locally. Rexhepi, who is the local high school caucus chair for the Young Democrats, took it upon herself to be that person for Centennial High School in Boise. She said she felt responsible to do something because she knows she's often viewed as a student leader. "I probably shouldn't wait for someone who just wants to advance their resume with a school shooting," she said, "which I don't think is OK at all." Eighteen-year-old Tommy Munroe, who is Centennial's student body president, feels a sense of urgency about this issue because, he said, Stoneman Douglas "could've just as easily been my high school." He doesn't want his generation — "the generation of Sandy Hook" — to become desensitized to gun violence. For Munroe, it's important for students to be able to be actively involved in politics — and for lawmakers to listen. "If the government wants to keep getting paid, they need to listen to what we say," he said. Rexhepi said that the overall message of the walkout is to encourage some type of change, and she's encouraged by the national effort. But even with her role in the Young Democrats, Rexhepi said that politicians and political parties are part of the conflict in the debate about guns. "It's become more about political party than actual beliefs," she said. Rexhepi worked hard to get the word out about plans for the walkout. She made flyers, which then found their way onto social media. Soon everyone knew, including the administration. The principal met with her and some of her classmates. To their surprise, they weren't in trouble. It took some convincing, but soon the walkout had the administration's support. According to Rexhepi and classmate Tommy Munroe, school administrators initially said they would clear student absences and even agreed to announce the walkout over the intercom. School reactions to the walkout have been as varied as opinions on gun rights. Even other Boise schools are responding differently. The neighboring Boise School District sent memos to parents saying their schools would follow regular attendance guidelines, meaning that parents would need to call to excuse their child's absence even if he or she were participating in the walkout. Administrators in the Boise School District were also directed to provide "alternative activities during lunch and break by which students can express their concerns and opinions," according to the memos, which were sent to NPR by Dan Hollar, a spokesman for the school district. NPR's Tovia Smith recently reported several schools that have made students afraid to participate in the walkout. For example, teachers at a high school in Boston were threatening students with write-ups and suspensions. But on the other side of the country in Idaho, Centennial High School's student body president Tommy Munroe said his friend Egzona Rexhepi has made an effort to make it easy for students to participate if they want to. One of the ways she made it easier, he said, is by adjusting the time of the walkout. While most of the country's walkouts are planned for 10 a.m., Centennial's is planned for 9:28 a.m. when the bell rings. This will allow students to walk out in between classes, rather than getting up in the middle of a class. Munroe said some students may be too scared to leave if they are in a class with a teacher who doesn't support the march, and so may not have an opportunity to participate. Rexhepi, Munroe and other classmates have dealt with some opposition from students on the other side of the issue. Earlier this week, Rexhepi had organized a poster-making party to prepare for the walkout. A student came in and used supplies Rexhepi had purchased with her own money to make an anti-protest poster. But Rexhepi wasn't deterred. "Everyone has their own individual beliefs, those are what the posters are for, is for people to express their voices and their opinions because they have a right to do that, of course," she said. "But overall, we all want some type of change. And that's why we're participating in the walkout." Adrienne St. Clair is an intern on NPR's National Desk.